Hey there! This tutorial will lead you through setting up your new station. It's especially tailored for those of you who use primarily use Creek to keep track of the music played by your station and its DJs. Creek HQ and Control Panel. To start working on your station, sign in to the Creek HQ with your email address and password. Then, click the button to hop over to the Control Panel to start working with your station. Sensitive information like API Keys for media storage. You and the DJs at your station can access the Control Panel directly at its own address. First Step: Build your schedule (and accounts). You will need to build your show schedule (or program schedule) in order to start using Creek. Also, any DJs or hosts will need accounts, and these accounts must be connected to their shows. Invite DJs to create their own shows (programs) and accounts. Manually create shows and add accounts to them. Shows only need user accounts attached if they have DJs or hosts. For example, automated shows don't need user accounts since they only receive music information from your automation system. A. Invite people to create their own shows and accounts. Add airtimes to the shows. A manager (you) will need to place the shows onto the schedule, by going to Tools > Shows. Click the spaces on the schedule editor, and select the shows that have already been created (rather than typing in new shows, which will create duplicates). Once you add these already-created shows to the schedule, your DJs should be ready to sign in and start working. Continue to the Shows, Broadcasts, and Playlists section below. B. Manually create shows and accounts. Each DJ will need to have both an account and a show with that account attached. To add shows, see this tutorial. To add accounts for DJs and hosts, see this tutorial. For managers, see this tutorial. To start adding playlists (and audio, and other content) for your shows, first we'll need to understand the basic structure of Creek's radio content. Shows are the main objects. They are the radio programs at the heart of your station. Shows are placed on the Schedule through Airtimes. Shows have Broadcasts, which are the main, recurring content for shows. Each time a show happens, there should be a broadcast for that date. Broadcasts have content, media, and playlists. This is the process that DJs will follow each time they do their show live. Go to the station website at http://station-name.creek.fm — or at your own domain, if you have one connected to your Creek station. Sign in. You will be taken to the Control Panel. Create a broadcast. The quick way is to just click Add Broadcast. Give the broadcast a title. Optionally, give it some text or media. Important: Make sure that the date and time for this broadcast are correct. You will be taken to the Playlist Editor. 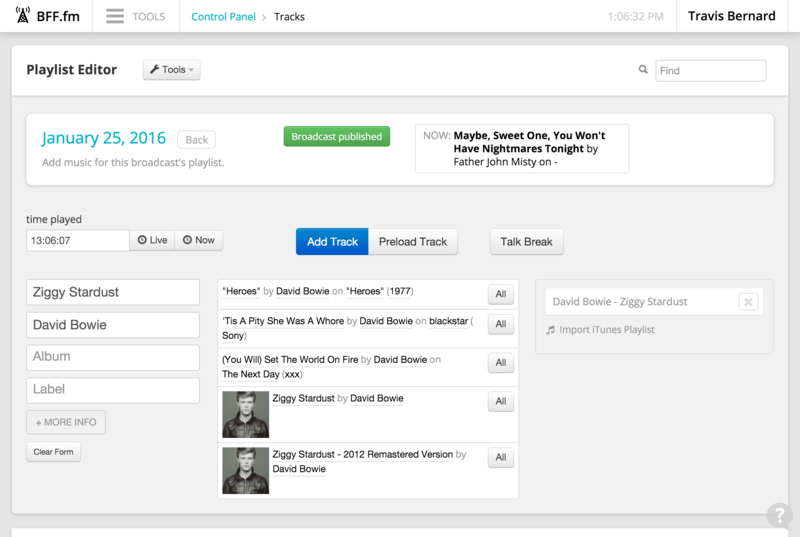 Here, you can add tracks by entering their artist, title, album, and label. Make sure that the start time for this current track is correct. For live playlisting, try turning on "auto time" by clicking the Now button. This will enter the time automatically. Once you click Add Track, it's added to the playlist below. You can edit previous tracks by clicking on them in the list at the bottom. You can push music information (metadata) to Creek through your studio automation system. Most automation systems have a way of sending tracks to a platform like Creek. Please check out the list of tutorials for various automation systems, here. Now that you have your schedule built, and your DJs have accounts and access to start building playlists, your station should be ready for action. Need any more help with this? We're always here to lead you through things. Just ask us for help! KUSF, at the University of San Francisco, produced this slideshow for their DJs who are using Creek. View Slideshow Here — It's in PDF form. Designed by Basile Inman.